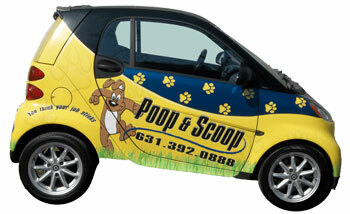 We started our Pet Waste removal company, POOP & SCOOP, here on Long Island in 2003. We are a family owned and operated business. You love your dogs and your yard and after working all week you want to come home and enjoy these aspects of life. The last thing you want to do is walk your yard looking for piles of poop or step in something you don't want to step in. That's where we come in. We pride our self on bringing your yard back to you and eliminate those tedious Poop Scooping chores. We provide a service that no one wants to do and we do it with pride. At Poop & Scoop we are fully committed to honesty, integrity, reliability, and being the best in the business. We stand behind our pooper scooper service with a 100% Satisfaction Guarantee. If you are ever dissatisfied with the quality of your service, just give us a call and we will send someone out to re-clean your yard immediately, for free. We also guarantee our prices, if we can't meet or beat our competitors it's free. Our coverage area includes Bay Shore, Islip and all of Suffolk County.